These mini pancakes are perfect if you can’t be bothered to sit there flippin’ over a skillet pan. Simply pop in the oven and serve with your favourite toppings! 1/2 cup gluten-free plain flour. 1/2 cup milk of your choice (full-fat, almond, oat, rice). 1/2 cup blueberries, fresh or frozen. 1. Preheat oven to 220°C/425°F/Gas Mark 7 and grease an 8 or 12 hole muffin tin with a little butter. Alternatively, you can use a non-stick muffin tin. 2. Place all ingredients in a blender and blend until smooth. Pour a small amount into each muffin tin, filling to about ⅔ of the way full. 3. Place in the oven and cook for 15 minutes, or until golden and risen. 4. 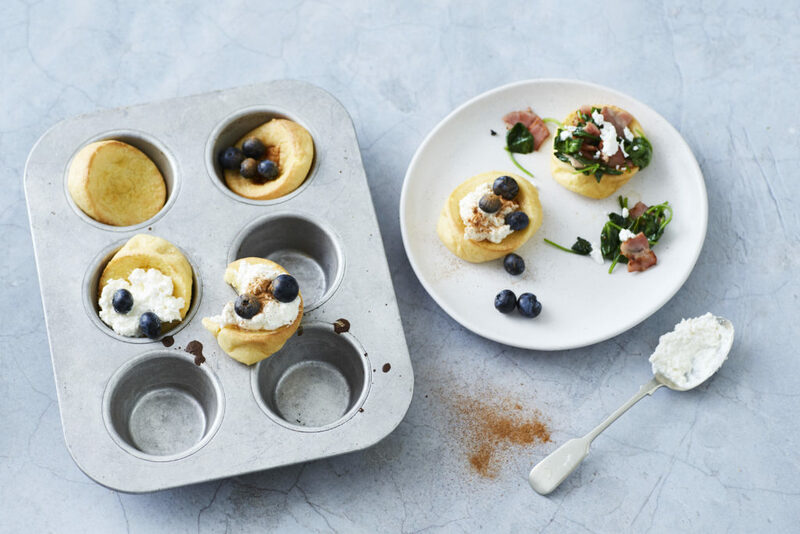 Serve warm and fill your mini pancakes with your choice of sweet or savoury toppings! For the Savoury Toppings: Sauté bacon and spinach in a skillet pan for a couple of minutes, or until bacon is cooked to your liking. Top your pancakes with the bacon, spinach and a sprinkling of feta cheese to serve.